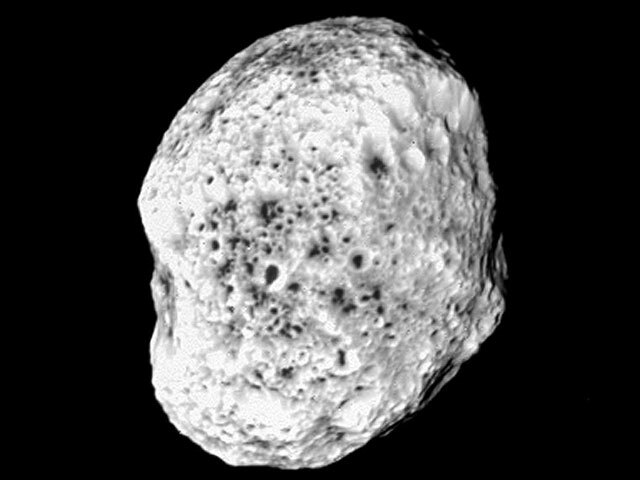 Explanation: Why is Saturn's moon Hyperion textured like a sponge? Recent high-resolution images from the robot Cassini spacecraft orbiting Saturn show Hyperion to be an even stranger place than thought before. Previously, it was known that the length of a day on Hyperion is unpredictable. The moon's highly elliptical orbit around Saturn, its highly non-spherical shape, and its locked 4:3 orbital resonance with Titan torque Hyperion around so much it is hard to predict when the Sun will rise next. The newly imaged craters on the unusually coarse surface are surely the result of impacts, but for some reason have dark centers. The low density of Hyperion indicates it might even be a spelunker's paradise, riddled with tremendous caverns.